Many will remember the old Amiga classic called Deluxe Galaga. It is, as the title indicates, a Galaga clone. The creator of the game, Edgar M. Vigdal, lifts the Galaga-experience up to a whole new level with this game. There are plenty of secrets to be found, bonuses to fetch, and challenges to face. A few years ago, Edgar M. Vigdal released a game called Warblade for the PC. 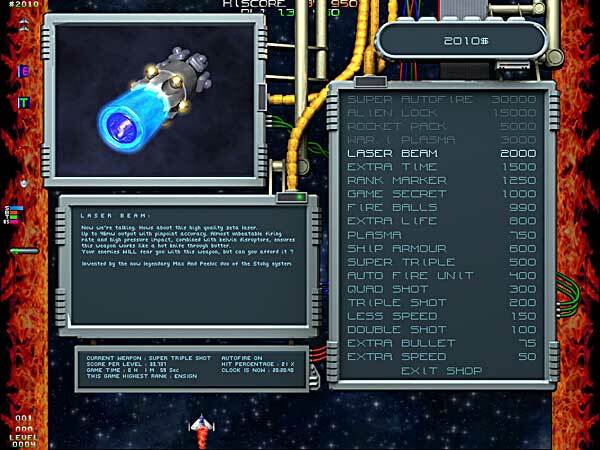 It is basically a powered up version of Deluxe Galaga, with several improvements. The game has seen many updates since its first release. These added more stuff and/or fixed bugs. In this article we’ll have a look at how Warblade plays and if it’s just as good as Deluxe Galaga. 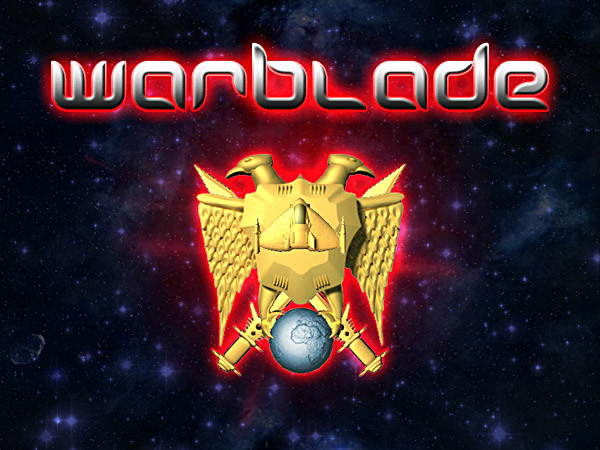 Warblade is a shoot’em’up game of the grand old-school. 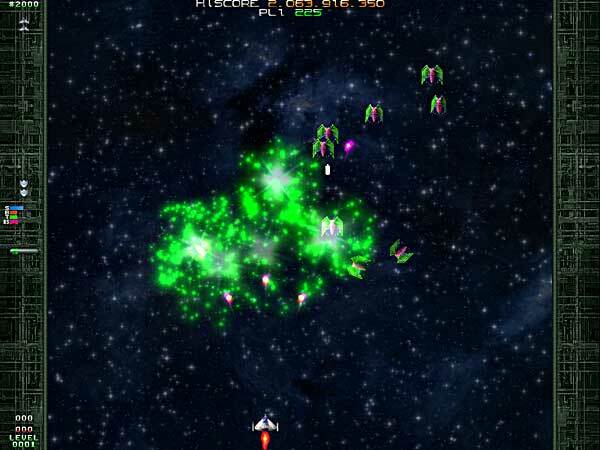 You are in control of a spaceship placed at the bottom of the screen, and your goal is to wipe out all enemy forces. The game is level based, so after you’ve cleared a screen, you move on to the next. Between every 25th levels, you’ll be facing a boss. These bosses can be quite brutal and provides you with a tough challenge. Besides blasting aliens to kingdom come, there are also mini-games appearing. One is the Memory Station, a puzzle game, which gives you the chance to collect some extra bonuses. The other one is Meteor Storm. In Meteor Storm, the aim is to avoid incoming meteors and collect bonuses on the way. Also worth mentioning is random encounters, such as the Warp Malfunction and the Tax Collector. I won’t write more about it, as it will spoil the surprises. In short, Warblade has variety and this makes the game last for a long, long time. In Warblade, there’s a total of 100 different levels. If you manage to survive all of those, the game will still continue. You’ll have to play all the levels over again, but it will be harder and harder, as the enemies grow tougher. The main point of the game is to accumulate points through various secrets and bonuses. There is an online high-score list featuring the best players, which can make things more interesting. You can play in either single-player or two-player mode. Warblade also sports a dual-mode, where two people can play simultaneously. Another fun addition is the Time Trial mode. Here you have a certain amount of time to gain as much points as possible. Quite fun. A cool thing about Warblade is that it includes a shop. Here you can purchase all kinds of weapons, game secrets, bonuses and so on. If you accumulate a lot of cash and don’t spend any of it, you might be visited by the in-game tax collector. You can customize Warblade to suit your taste. You can play either easy, normal, hard or ace mode. Ace mode is incredibly difficult, so beginners should try out normal or easy to begin with. Music can easily be changed. This counts for the speech as well. You can include a list of your favorite MP3’s to run in the background. There are also packs containing music and voices that can be downloaded. Beside this, if you have a slow machine, you can turn off a lot of features that requires better hardware. This makes the game run faster and smoother on older machines. Last but not least, you can make your own account inside the game. This will register all the statistics from the games you’ve played. For example, your highest score, number of bullets fired, number of secrets found, and so on. It’s a great addition and it makes you come back for more. There are plenty of other options to try, but I won’t mention all of them here. Playing Warblade is a lot of fun. It’s energetic, hectic and challenging. It has a lot of secrets to be found and unlocked. It sports variety, which makes the game entertaining. Mastering this game can take a bit of time. You’ll have to learn the attack-waves of the enemies, which weapons to use and how to upgrade your ship in the best possible way. Deluxe Galaga was a great game and it still is. It plays just as good now as it did back in the middle of the 1990’s. Although, Warblade has much more to offer than his older brother. More secrets, weapons, bonuses and extras are some of the keywords here. The gameplay has also been substantially improved through the increased variety of options. 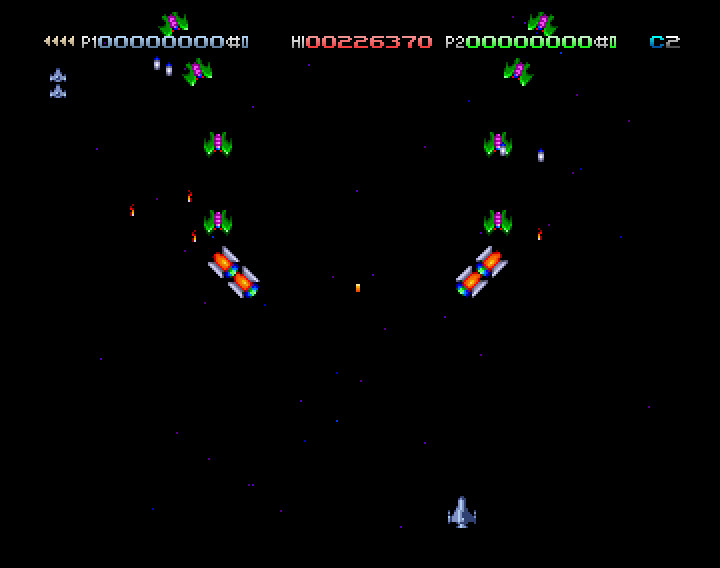 There is one thing though that Deluxe Galaga did better. That was the credits system. This was removed in Warblade, but I really don’t know why. If you played two-player simultaneously you could help each other out with credits and thereby survive for a longer time (even if that meant the loss of a huge amount of points). This is impossible in Warblade and it might be a feature quite a few people miss. On the other hand, Warblade has a save game function which partially makes up for this. To sum up this piece on Warblade, I would like to recommend this game to everyone that enjoyed playing Deluxe Galaga on the Amiga. It’s really worth a try even if you are not into shooters. Warblade follows the same tradition as the old title and it truly delivers in terms of game play. As a last note, there are modules from the old Polish Amiga musician XTD/Mystic in the game. That is something I value for sure. It’s been a few years since I published this post.. it was back in 2011! 🙂 Thought maybe some of you newer readers would appreciate the review. My wife and I have started playing Warblade again – we just had a go and almost completed it on Hard-difficulty. In the old days we did it on Ace, but it takes time to get back on track with the game again. 😉 Anyway, enjoy the review!